Shell small, approximately spherical, with 4 to 8 short, truncate, cylindrical tubes without differentiated termination, which occupy most of the surface of the sphere. Pores small, subcircular, not very variable in size, similar on the tubes and the sphere. Based on 30 specimens from 62.1-20-2, 84-86 cm and 66.1-4-3, 25-27 cm. Overall diameter (including tubes) 70 to 120μ. 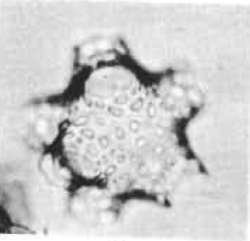 This species differs from other members of the genus in the small number of tubes which occupy a very large proportion of the surface of the sphere. Picture: pl 4 Figures 1: Holotype, 62.1-22-2, 84-86 cm, SI. 1, V32/0 (255X). 2: 62.1-22-2, 84-86 cm, SI. 1, C29/2, (255X).